The Large Reindeer Stencil is fantastic for classy festive decorating, creating large mobiles, frosted window features and special wintry scenes. 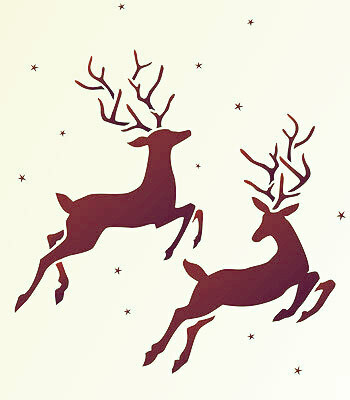 The two different large leaping reindeer motifs can be tilted and rotated to different angles to create the feeling of movement and to bring out the different characteristics of these graceful creatures, so they can appear to be running, jumping up or flying – as demonstrated in our illustrations here! 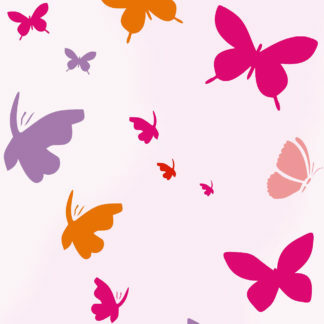 This stencil makes a beautiful gift for someone special. 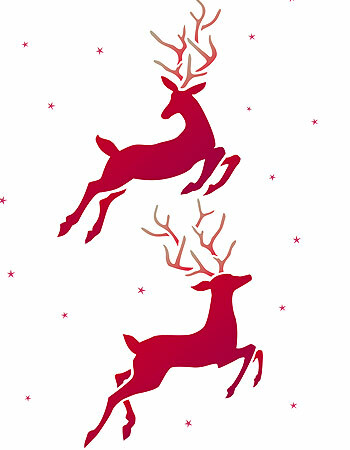 This easy to use stencil is on two sheets with two different reindeer motifs and additional stars surrounding each reindeer. See size specifications below. 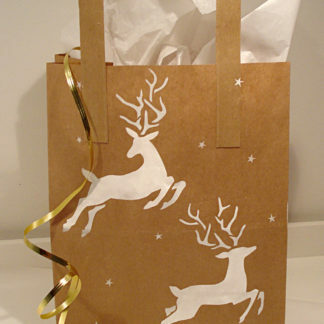 For smaller version of this design see the Little Reindeer Stencil. 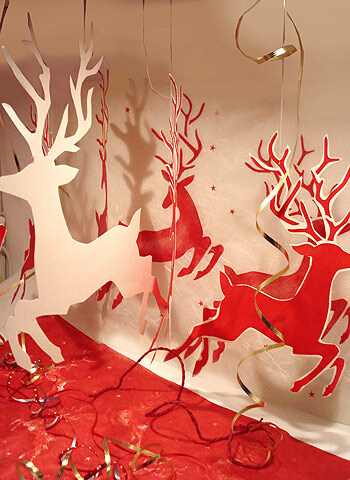 Above top – the Large Reindeer Stencil has been used to create this stunning festive hanging mobile – the reindeers look like they are running in a forest and the gradual movement of the mobile create a restful festive feature! Above – the Large Reindeer Stencil have also been stencilled onto textured tissue paper and hung as a backdrop to the mobile – stencilled in Very Berry Stencil Paint and blushed with Antique Gold Metallic Stencil Paint. 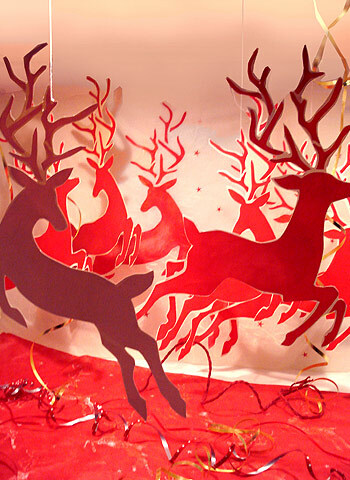 Above – the Large Reindeer Stencil with each motif tilted to create these dramatic poses. 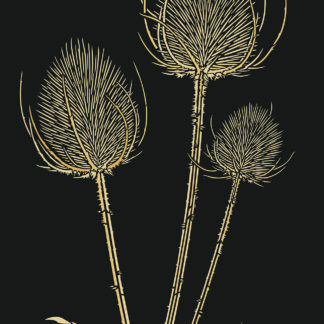 Shown here in Very Berry and Raspberry Stencil Paint with Mocha Stencil Paint blushed on Antlers – on a warm yellow background. 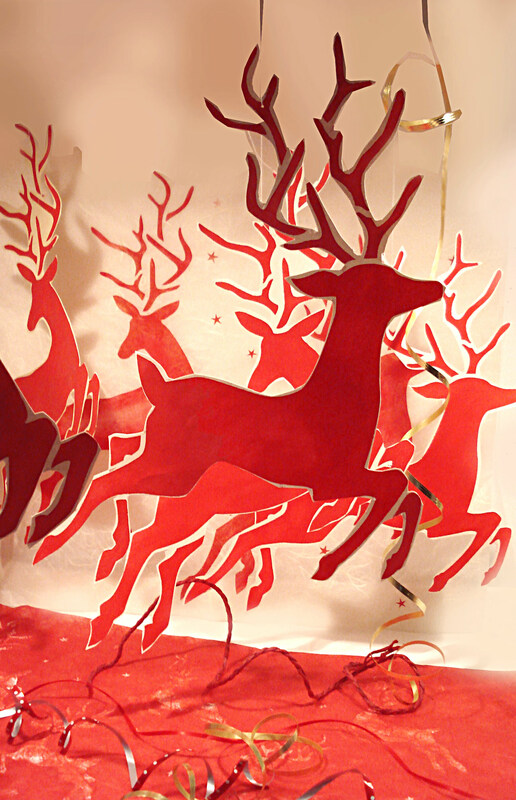 Above – the Large Reindeer Stencil arranged so the reindeer appear dashing forward. 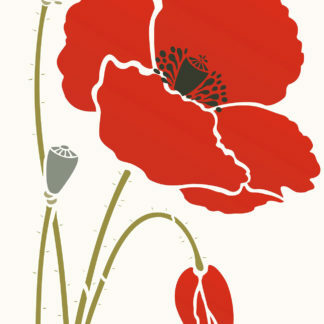 Shown in Very Berry and Raspberry Stencil Paint with Latte Stencil Paint blushed on Antlers – on a pale grey/yellow background. 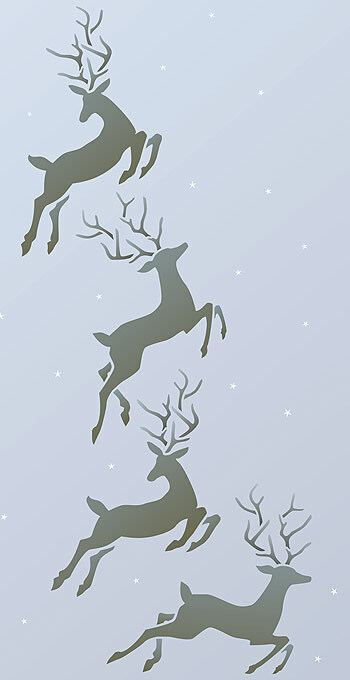 Above – the Large Reindeer Stencil repeated at different angles in a vertical column. 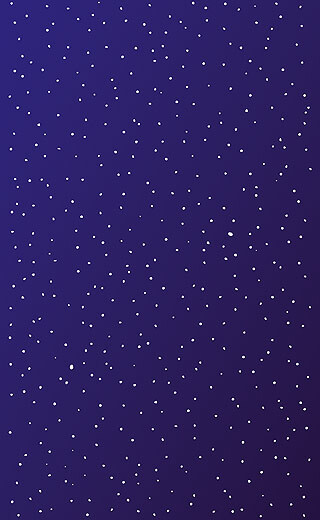 Shown in Arctic Grey and Coffee Bean Stencil Paint with stars in Ice White Stencil Paint on a lilac-grey background. 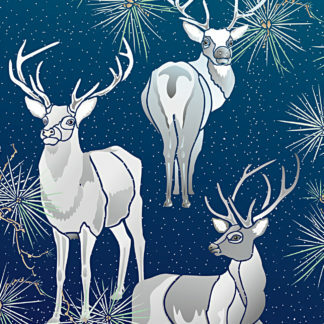 Above – the Large Reindeer Stencil shown in Coffee Bean and Agapanthus Stencil paint. Also see the Little Reindeer Stencil. 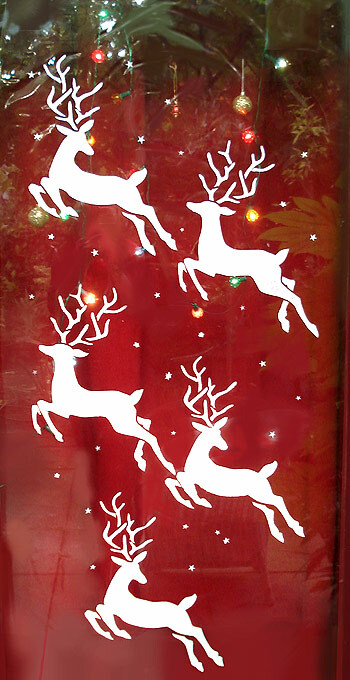 Above – the Large Reindeer Stencil stencilled silhouette style as a frosted festive window – stencilled simply in Ice White Stencil Paint. 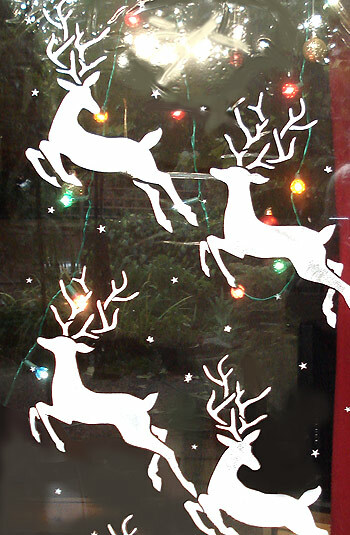 Above – the Large Reindeer Stencil make this fantastic window feature, perfect for wintry decorating. Top tip – get a roll of cellophane gift wrap and secure it to the glass and smooth out wrinkles, then stencil and after use roll up loosely to use again and again – and it saves all that cleaning and loosing your stencil creation! 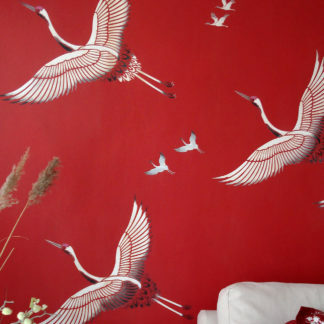 Or see our guide Stencilling Frosted Windows. 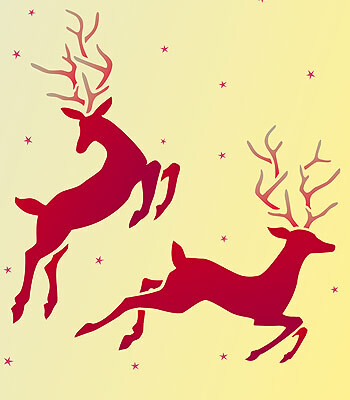 Above – the two motifs of the Large Reindeer Stencil in striking Ice White Stencil Paint on a festive red background. 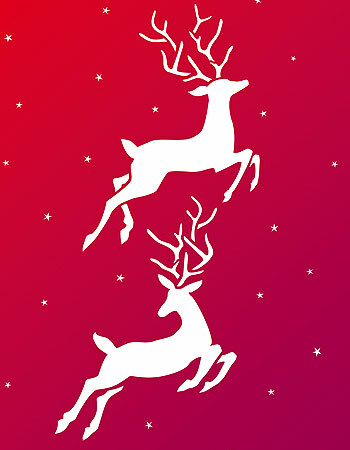 Above – the Large Reindeer Stencil in festive red on white – shown in Very Berry and Raspberry Stencil Paint with antlers blushed with Mocha Stencil Paint. 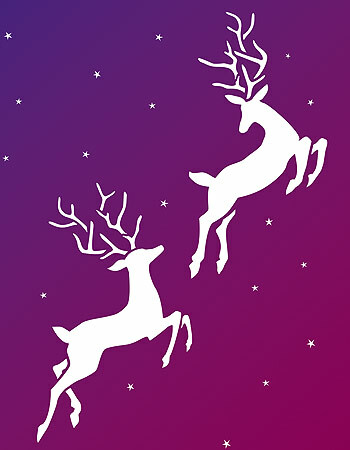 Above – the Large Reindeer Stencil silhouette style in Ice White Stencil Paint on a rich purple background. 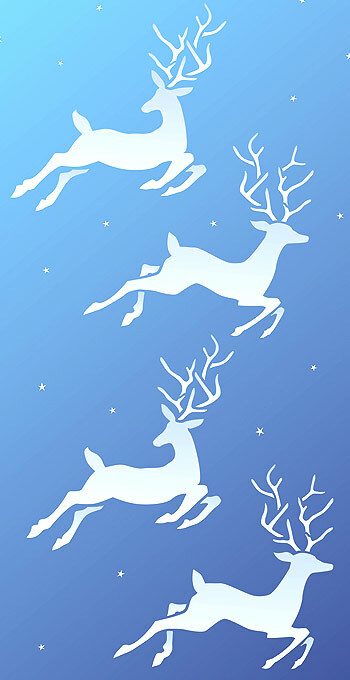 Above – the Large Reindeer Stencil stencilled to appear as silhouettes racing across the night sky – shown in Ice White Stencil Paint on a blue-turquoise background. 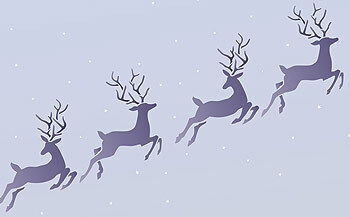 Above – the Large Reindeer Stencil repeated diagonally in French Lavender and Agapanthus Stencil Paint on a dusky lilac background. 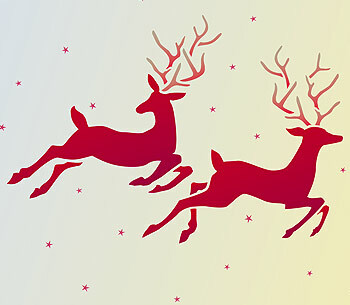 The Large Reindeer Stencil is a one layer stencil, two sheet stencil comprising two different large reindeer motifs, surrounded by small star motifs. On 125 micron Mylar. Reindeer 1 (left below) is approximately 36cm/14″ tall x 27cm/10.5″ wide. Dimensions can be altered by tilting design. Reindeer 2 (right below) is approximately 36cm/14″ tall x 26cm/10.25″ wide. Dimensions can be altered by tilting design. 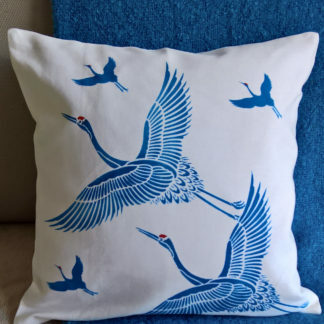 Sheet size 43cm/17″ tall by 32cm/12.5″ wide. 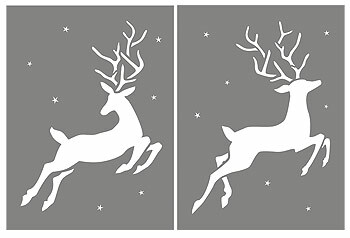 Left – layout of the two sheets of the Large Reindeer Stencil showing both reindeer and starry backgrounds.